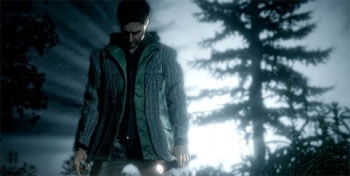 Alan Wake for PC is "Still on Remedy's Hard Drives"
Remedy writer Sam Lake threw a bone to PC gamers today, saying that the code for the PC version of Alan Wake is "still on our hard drives." Remedy's Alan Wake began life as a PC title before Microsoft decided it wanted an Xbox 360 version as well, and then finally to make it an Xbox 360 exclusive. A lot of PC gamers were outraged over the move, but they also held out hope that one day the game would still come to their platform of choice. And while Remedy's Head of Franchise Development Oskari HÃ¤kkinen said last month that the studio had "no plans" for a PC release, another Remedy man has suggested that maybe there is a reason for the mouse-and-keyboard crowd to hold on to hope. "The code for a PC version of Alan Wake is still always on our hard drives," writer Sam Lake - real name Sami JÃ¤rvi - told German site PC Games in a Google translated and thus slightly mangled interview. "It would be unreasonable, this work - and believe us, since much work goes in there - [to] just throw it away." Alan Wake launches in May as an Xbox 360 exclusive but Lake pointed out that there's no guarantee it will remain that way forever. "The latest example is the Stimulus Pack for Modern Warfare 2. This will only appear on Xbox 360 and later for PC and PlayStation," he said. "I can well imagine that Alan Wake will suffer a similar fate." "Suffer a similar fate" probably isn't the best translation, but you get what he means. Dare to dream, PC gamers!